I love to get out in the wild and experience animals the way they should be. 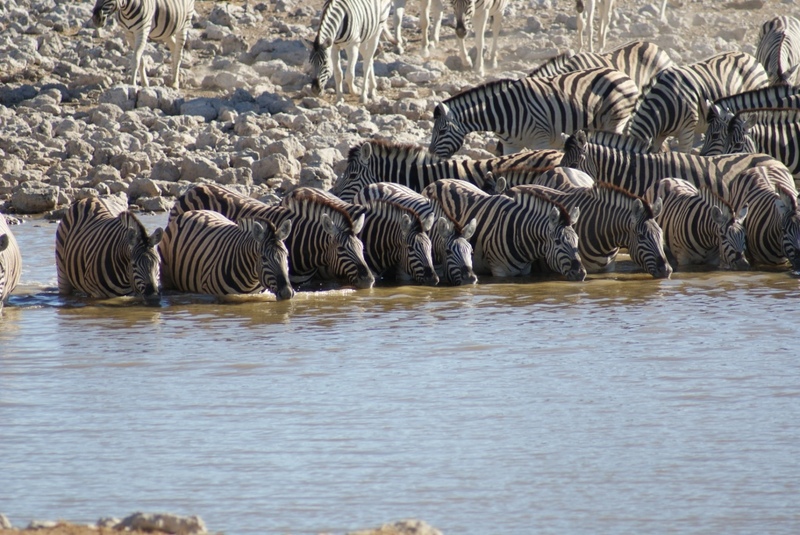 Etosha National Park in Namibia, like quite a few other parks, will give you that experience. However, it will also lay animals on a plate for you so if you are a lazy watcher, you can be guaranteed of good viewing without having to hunt all day for good opportunities. How do they do this? Well, there isn’t much water in Etosha, that’s why there are no hippos or buffalo, so if you dig deep enough to sink a bore and create an artificial waterhole, you will have animals coming from miles around. Then, the next step is to plonk a tourist trap like a very plush resort right next to that waterhole, build a fence round the water with viewing platforms and seats. Now not only will the animals line up but you will almost have to too, simply because every man and his dog is there for the experience. I’m being a bit flippant here since I like to work for my experiences but in truth, Okaukuejo gave me some incredible shots. 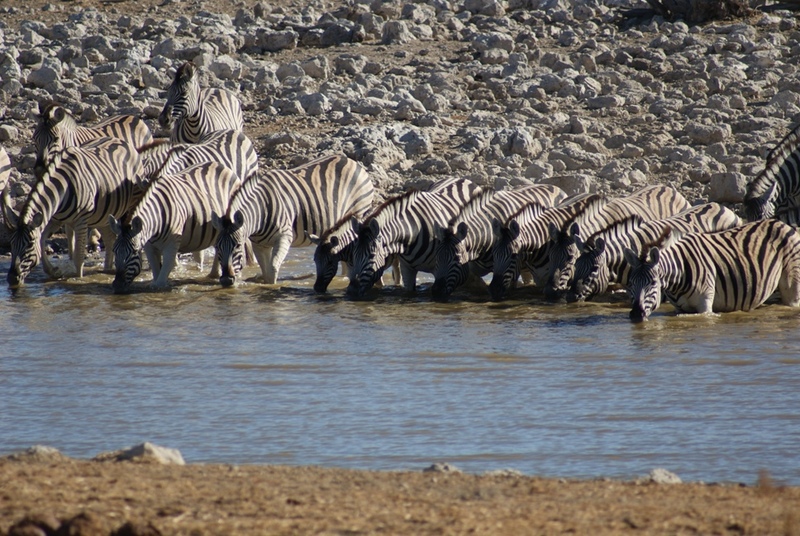 Zebra would literally wade into the water with no fear of being attacked by crocodiles (since they don’t live in Etosha either) and line up to drink like the ones in the photo below. What else? I sat there and watched giraffe, elephant, rhino, kudu, jackals, springbok, oryx and quite an assortment of birds all use the waterhole. I even heard lion at night. I knew I had to paint something from here. 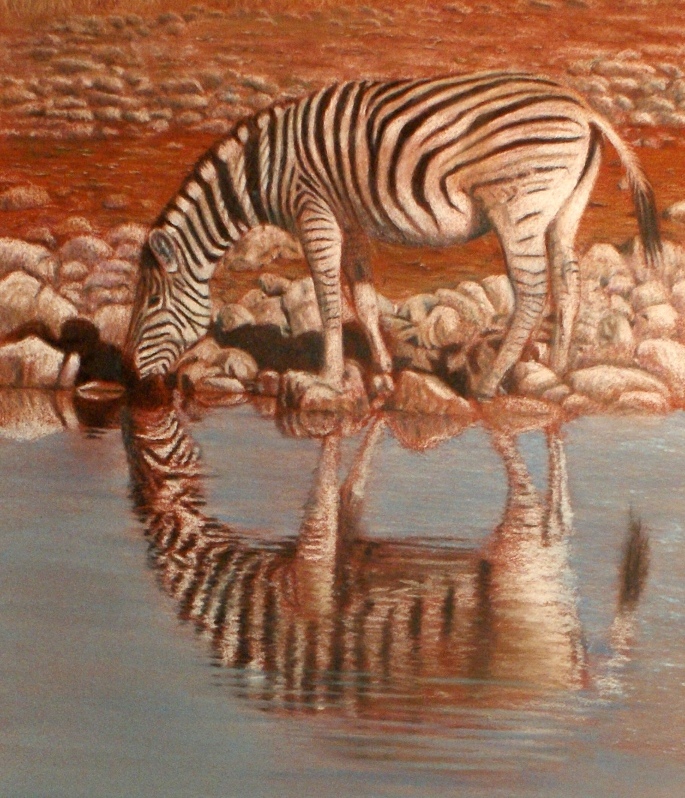 The following piece is a zebra drinking in the still morning air, creating a clear reflection and an air of tranquility. I’ve used a combination of coloured pencils and pastels on Art Spectum’s Terra Cotta coloured Colourfix, which is a sanded paper. I deliberately chose this colour as I could then let it show through to help the ground and the dusty zebras coat with that colour. The previous day was windy (as the ripples in the above photo attest to) and zebra can pick up a light dusting of this colour on their coats. Patrick, nice blog- I enjoyed it alot. Thanks. As always- gorgeous work. I envy you your trips to see the wildlife. Great photos. Beautiful zebra painting!! Very unusual composition but it really works. Zebra reflections are mesmerizing. I love how it looks like a moment in sunset light. And Etosha is an amazing place!! I just discovered your blog through WetCanvas forums.